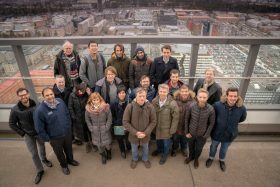 European Researchers check the air quality in Kista, Sweden to kick-off the ULISSES Project activities. Collaboration Aims to Develop a New Class of Miniaturized Optical Gas Sensors on a Chip, Enabling Low-Cost Distributed Sensing Nodes for the Internet of Things. AMO GmbH, Senseair AB, KTH Royal Institute of Technology, Oxford Instruments Plasma Technology Ltd, Graphenea Semiconductor SL, Universität der Bundeswehr München, Catalan Institute of Nanoscience and Nanotechnology, and SCIPROM Sàrl announced today the launch of the ULISSES project, a European collaboration to develop a new class of miniaturized optical gas sensors on a chip. The project partners will collaborate to combine silicon photonics with 2D materials, to enable fully integrated optical gas sensing nodes for the Internet of Things (IoT) that can be manufactured in large volumes at low cost and achieve performance improvements in terms of size and power consumption. The development would enable personal gas sensors embedded in wearable devices, as well as installed in public infrastructure, such as in street lighting, on busses and in taxis, or even in small unmanned aerial vehicles. The new technology aims to empower the general public to monitor and put demands on their air quality. Over the next 4 years, AMO will fabricate silicon photonics chips with integrated silicon waveguides and 2D material-based photodetectors, developed by KTH and AMO. The project is coordinated by Senseair AB, a leading gas sensor supplier, supported by SCIPROM. Oxford Instruments Plasma Technology will further develop its nanotechnology process tools. The 2D materials will be provided by the Universität der Bundeswehr München and Graphenea. Senseair will lead the different application demonstrators and prepare the sensors for IoT applications. ICN2 will provide modelling and simulation, in order to optimize sensor design and efficiency. For more information on ULISSES, please visit www.ulisses-project.eu. T he ULISSES project has received funding from the European Union’s Horizon 2020 research and innovation programme under grant agreement No 825272 (ULISSES).